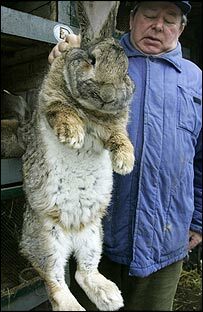 The 13th Colony: Giant rabbits to feed North Korea's hunger! Karl Szmolinsky, a 67 year old, East German pensioner that have breds rabbits the size of dogs for 47 years was asked by North Korea's ambassador whether he might be willing to sell some rabbits to set up a breeding farm in North Korea. North Korea is a country of 23 million which have widespread food shortages and many people "struggle to feed themselves on a diet critically deficient in protein, fats and micronutrients" according to the United Nations Food Programme. Each of Karl's 'German Grey Monsters' weigh about 7kg and can be used to feed 8 people. He was delighted to help the North Koreans, that he gave the North Koreans a special price, Â80 per rabbit instead of the usual Â200 to Â250. Interesting idea but surely the rabbits will eat far more in Veg than they will produce in meat, but at least shows that when backed in to a corner people are at least willing to try something new and different and think out side the box, if only we could get a government to do that with fuels for the 21st century rather than sticking to fossil fuels and taxing and thing different out of the market.